This week's giveaway comes to us from the lovely Sabine from La Marquise de Anges. Sabine once held a giveaway on D&OC from her whimsical handmade shop, but she has recently opened a French Vintage Shop that I am completely smitten with. 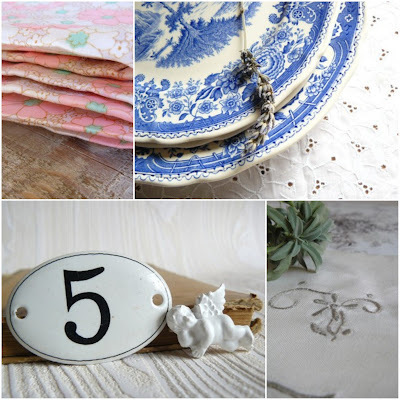 Based in France, Sabine finds unique vintage fabrics, housewares, jewelry, bottles and other sundries that make my heart go pitter patter. She also has a way of styling her pictures that makes her Etsy shop uniquely beautiful. How to Enter, this giveaway is open to everyone (up to 3 entries)? 1. Visit the shop and tell me what you like. How would you spend the $25? If you don't already know Sabine, I suggest you do because she's one of the kindest bloggers and shop owners I know and I'm sure she'd happy to spread the love to you too! Good luck and thank you to everyone who took my little poll. Happy Weekend! Lovely giveaway ~~ wonderful shop! Have a beautiful weekend Christina!! So hard to choose! I love the vintage butter jar or the Olive container. I would put the $25 toward that gorgeous vintage sprintic! oh my! Oh, I can't decide! everything Sabine does is just lovely! 2 words - vintage buttons. the store has stolen my <3 love love love the buttons. So many pretty things... i would have to go with the romantic looking chemise de nuit blanche . white cotton antique nightgown. I'm newley engaged and i fell in love with the idea of wearing this. I'm in love with the FOLKLORE napperon . hand embroidered vintage doily mat. i really like the butter dish and the plates! OMG OMG OMG!!!! mini beurrier . vintage mini butter dish... ADORABLE! I MUST HAVE IT!!!! Gotta have that Leo pendant...its my sign and definitely my style! TOILE DE JOUY .Vintage fabric. We have a toile quilt on the bed and this would make a sweet pillow. And I absolutely love Sabine and her shops. I would put the $25 towards one of the lovely vintage books. I've already got one from her shop, and would love to add to my collection. Her talents and eye for beauty is incredible! I have my heart set on the premier dictionary and the petticoat! oH YES, YES, YES, i FOLLOW YOU! im a follower as well!! i'd love the white petticoat skirt! I love the "assiette a soupe. vintage plate". Such a lovely store. I LOVE the mother of pearl and brass bangles. They would look good with anything! Gorgeous giveaway, as always! I love the "assiette a soupe. vintage plate"
Gorgeous products! I am a follower. I love the vintage floral fabric! So pretty! 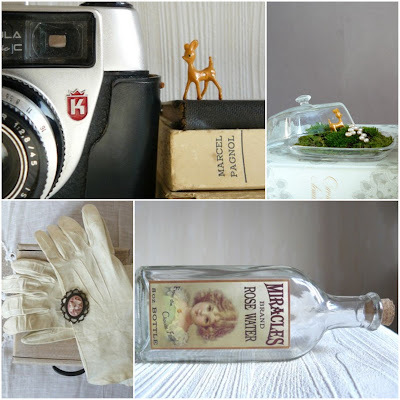 Ohhh I love love love the appareil photo vintage regula sprintic C :) Thanks for the great giveaway! Sabine is such a talent with a great eye for design. I'd go for the pretty blue and white dishes. I just became a follower I'm happy to say. i love love love sabine and her beautiful blog and shops! aren't her photos just stunning! Beautiful shop! I would choose the "BRODERIE . hand embroidered old napperon or tea towel"
I love the olive pot! what a great shop! i would have a really hard time choosing between that lovely butter dish or any of her fabrics! The FABRIC. Holy crow, they're all beautiful. Simple and sweet. So happy to see Sabine featured on your blog. She is a dear and I would love to have any of the beautiful french books from her shop! 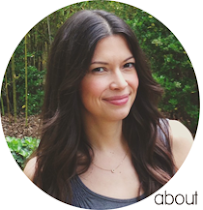 I follow your blog and think it's lovely! I would love the white cotton blouse or these perfect boutons dernier cri! I love the vintage bottles! i would choose the vintage dessert plate, no doubt about it! i find that's one of the things i'm loving most about france, the serving of dessert with every meal — alleviates the urge to snack later on in the evening and is such a lovely excuse to sit at the table longer with my host family! The fantastic blue and white soup plate please!!!! Come back for a visit soon, yes? i love the bracelets de nacre. 2 mother of pearl and brass bangles. Ooh I love all the tea towels! I am now also a follower!